Caption: Headteacher, Richard Gower, and pupils enjoy the new library at Kingsleigh Primary School. 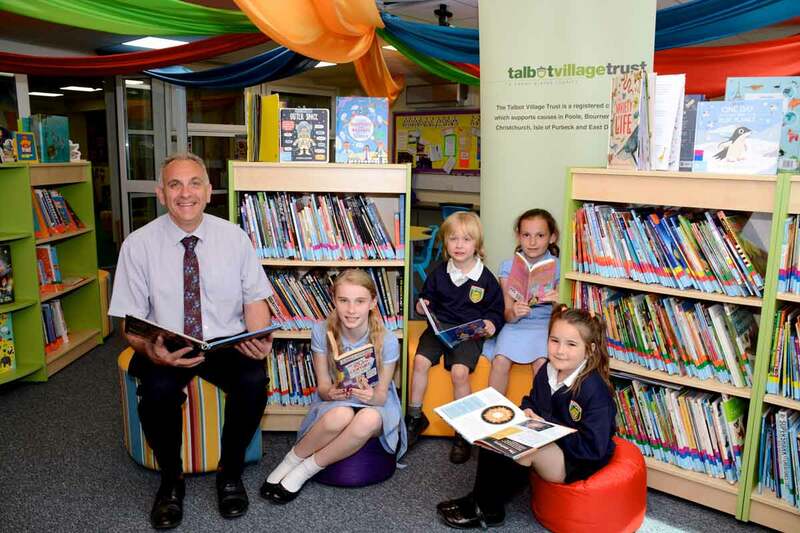 Talbot Village Trust donated £10,000 to Kingsleigh Primary School to redevelop its main library and create two new reading areas. The grant from the Trust has meant the school in Bournemouth has been able to renovate the existing library, making it an attractive space which pupils enjoy using. Part of the funding has also been spent on updating the library’s contents to allow children to have access to high-quality reading material, both in timetabled lessons and during their free time. Assistant headteacher of Kingsleigh Primary School, Holly Graff, said, “We have more than 700 children in our school who have all benefited from the funds that were generously donated to us by Talbot Village Trust. Developing a lifelong love of reading is something that we are passionate about as a school, and this grant has helped us take another giant step towards reaching this goal. Talbot Village Trust meets biannually, and will be accepting applications for funding from both previous and new applicants in the area before the Trustees meet in the autumn of this year. Visit www.talbotvillagetrust.org for more information.